In an event that took place in late January at Cal Poly San Luis Obispo, atheist activist Dr. Herb Silverman (wearing a trademark t-shirt) and Liberty University professor Dr. Karen Swallow Prior debated the question: Would society be better off without religion? The video is now available online. If you like 90-minute debates, you’ll enjoy this. If any particular moments stand out to you, please leave the timestamp/summary in the comments. 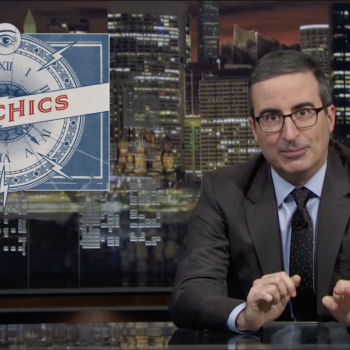 February 25, 2019 John Oliver Exposed the Media's Complicity in Promoting Psychic "Mediums"